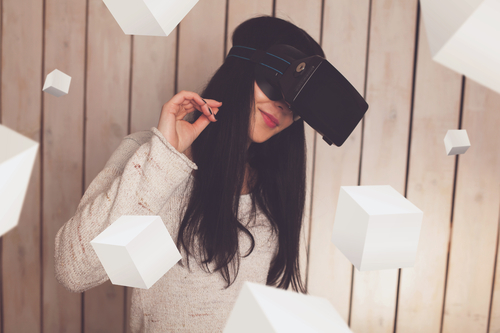 Using computer technology to create a simulated environment, known as Virtual Reality (VR), is a hot new marketing trend that’s spreading fast. From fashion brands to car manufacturers, companies are embracing the virtual reality world. A California-based slip-on shoe company, Toms, is most well-known for its One for One business model. With every Toms purchase, the company will help a person in need. During a trip to Argentina, Toms founder Blake Mycoskie was impacted by the number of kids growing up without shoes. He wanted to create a shoe company that would match each pair sold, giving a pair of new shoes to a child in need. Today the company gives back to people in need in more than 70 countries. And with the help of virtual reality, Toms is inspiring others to give, too. At five stores across the U.S., Toms is giving customers a behind-the-scenes look with something called a Virtual Giving Trip. The VR experience uses 360-degree video footage that completely immerses the user. The experience is about five minutes long and tells the story of the Toms company, narrated by Mycoskie. The VR experience shows just how much Toms gives back in a compelling and heartwarming way, inspiring consumers to take action. Additionally, consumers with their own VR headsets can view the video on YouTube. Nonprofits can learn something from Toms VR marketing and employ a similar experience tailored to their own mission. The automakers are putting potential consumers behind the wheel and consumers don’t even have to leave the couch. The VR experience is the first of its kind that can be done on a phone. Users simply pair their smartphone, a Samsung Galaxy S7, for example, with a VR headset like Oculus or Cardboard to take part. Since its inception, there have been many positive reviews on the app, with lots of press and views on YouTube as well. The 360-degree video takes users, or drivers, across a beautiful landscape and gets the driver familiar with the car. After its release, there have been 51,000 inquiries for more information about the XC90. It is safe to say that this VR marketing technique is working for the automakers and marketers at Volvo. Companies can follow suit by creating their own “test drives” so to speak by creating experiences that showcase goods and products. The New York Times is an award-winning source for breaking news, reviews, opinions and more for many readers across the world. While some may claim that newspapers are dead, The New York Times is modernizing the industry with VR. In 2015, the publication sent out Google Cardboard, a VR viewing device, to all of its subscribers before running a story titled “Displaced.” With 360-degree video, the company was able to tell the hard-hitting story, which covers the lives of just three of the 60 million people who have been driven from their homes due to war and prosecution. The multimedia aspect is more powerful than simple text. Jack Silverstein, editor-in-chief of The New York Times magazine, said, “We decided to launch The Times’s virtual-reality efforts with these portraits because we recognize that this new filmmaking technology enables an uncanny feeling of connection with people whose lives are far from our own. By creating a 360-degree environment that encircles the viewer, virtual reality creates the experience of being present within distant worlds, making it uniquely suited to projects, like this one, that speak to our senses of empathy and community.” This year, The New York Times won an award at Cannes for “Displaced.” The content is still available online for all users to see. The New York Times also established an app called NYTVR that is available via the Apple Store and Google Play. Publications can take note of the longstanding paper’s approach to fresh, compelling content.